The days of draggable and humongous laptops are past as the Ultrabooks have taken over the market place and there’s plenty of different models to choose from. Last year I tested Fujitsu’s first generation Ultrabook and now it’s time to check out the second generation with LIFEBOOK U904 as part of the Master your business campaign. 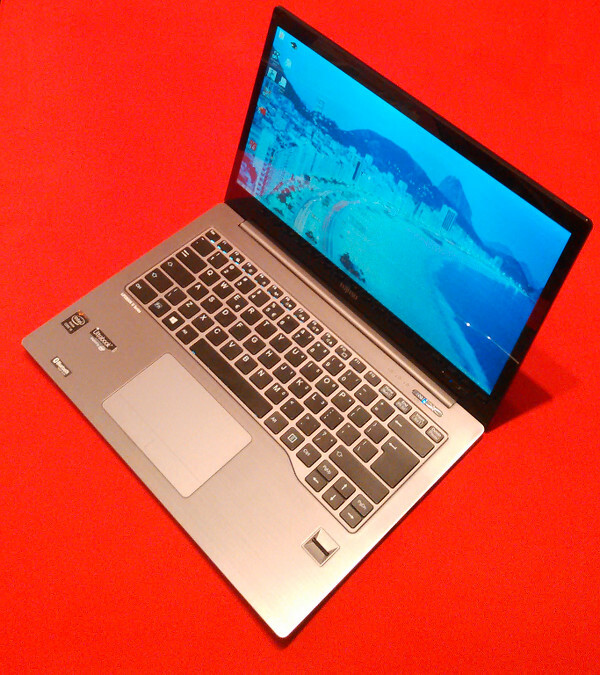 During the spring I will put this nice Ultrabook through different tasks and write about how it performs. Also also the readers can take part and win an overnight stay at a Marriott hotel. The Fujitsu LIFEBOOK U904 at first glance is marble black with aluminium and magnesium housing which makes it robust and light. Behind the 14″ screen there’s brilliant IGZO touchscreen with 3200 x 1800 resolution and it’s run by Intel Haswell Core i5-4200U -processor and integrated HD Graphics 4400. It comes with Windows 8.1 Professional and 6 GB RAM and 128 GB SSD drive. To make it a perfect for mobile office the U904 is equipped with embedded 3G/4G modem. You can also find full size Ethernet port, WLAN, Bluetooth and dock connector. After couple of weeks Fujitsu’s second generation Ultrabook is very promising and feels good. The touch screen brings more usable scenarios for Windows 8 but it would be better if it could be turned around for tablet like use with pen. The chiclet keyboard works nicely and is responsive but doesn’t have as precise and sharp feeling as in my Macbook Pro. The stereo speakers’ sound is a bit cold and hard but using headphones is fine. Although LIFEBOOKs are meant for business applications they can be also used for entertainment like gaming. The graphics chip could be Iris Pro series but also the 4400 has enough power to run for example Mark of the Ninja, Dead Space, Rocksmith and Alan Wake. During the spring I will put this nice Ultrabook through different tasks and write about how it performs to the Master your business site. I will also do a short review later with more insights to the U904 and with some test results. I’m testing the LIFEBOOK U904 as part of Fujitsu’s Master your business campaign with 16 other bloggers around the Europe and Middle East. Part of the participants tests the ESPRIMO Q920 minicomputer. The campaign will last about three months until 11.4.2014 and there will be 15 tasks for the bloggers to solve. If I do two thirds of the tasks I get to keep this nice Ultrabook. Also the readers can participate and win an overnight stay at a Marriott hotel. You can follow my progress with the tasks and read my experiences from my profile and this far I have done the unboxing video, how Intel’s vPro works, covered some possible use cases. Comments and questions are welcome. And you can always follow me in Twitter.